Toxins from common household cleaners and the problems they can cause are becoming an increasingly big concern among parents. These cleaners are laden with man-made chemicals that can cause health issues like respiratory problems. If your household has pets, this should also be a concern. Instead of just worrying about these issues, there is something you can do. 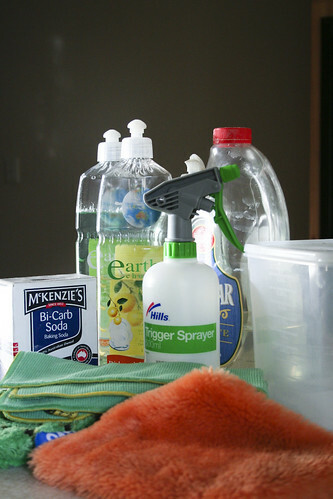 Making your own cleaning products allows you to control every ingredient that goes into them. There are a few big bonuses that come along with this practice. The first is that most are super simple to make and use items you likely have in your pantry right now. The second bonus is that these products are very inexpensive and will actually cost less than buying the chemical cleaners. Finally, you will not only contribute to a healthier household but also to a healthier environment. It is best to use a natural liquid soap like Dr. Bronner’s, which is a castille soap. But in a pinch, any mild liquid soap will do. Combine the two ingredients into a gallon of water until they are well mixed. Use in a spray bottle for things like cleaning the top of the stove, counters, tables, desktops and the like. Store extra in a dark cool place so the water doesn’t evaporate. This is an unscented cleaner but you can make it scented by adding a few drops of an essential oil of your choice. Glass needs a special cleaner because regular cleaners will often leave streaks behind which can be very unsightly. Combine the two ingredients into a spray bottle and spray directly onto soiled windows. Wipe clean with a cloth or paper towel. This can also be used on mirrors, which also tend to get streaky if a special cleanser is not used on them. If the windows are particularly dirty (such as the outside of windows that haven’t been cleaned in awhile), then substitute the vinegar for rubbing alcohol instead. Mix the soap and baking soda in a shallow dish. Add a little more soap if necessary until a paste is formed. Use this paste like you would use any liquid abrasive cleanser. Again, it is best to use a natural castille soap like Dr. Bronner’s. Combine the two well and dip a rag into the mixture. Polish furniture as usual. It doesn’t matter if the olive oil is regular or extra virgin since you won’t be cooking with it. You can also substitute orange for lemon for a different scent. To make any of these cleaning products, you likely won’t have to buy very many ingredients, as most are already in your pantry. Even if they aren’t on hand, they are very cheap to buy and the cleaners are easy to make. When you add in the peace of mind that comes from not having dangerous chemicals in your house, the advantages of making your own cleaners far outweigh the convenience of pre-made cleaners. Try it today. Christine Lukes is a personal finances guru and freelance blogger for Savings Account.org a site she highly recommends as using a savings account properly is a great way to manage your income. Next Article StyleUnited: New View, New You! The above article was submitted by a guest blogger. Would you like to submit a guest post for this blog? Either contact us or register here if you'd like your very own author box like this!